might need. And to help, “Accessory Michael” Foster and his team are always ready to offer some product knowledge, practical wisdom, or how-to expertise that you simply won’t find at a box store. Michael is always happy to answer any question with comprehensive knowledge, a patient spirit, and a quick wit. 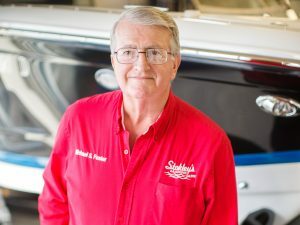 Having been with the Stokley’s crew since 2000, Michael is an educator at heart and loves helping boaters obtain and employ just the right boat accessories for their needs. We stock a complete line of Mercury aluminum and stainless steel propellers; trailer tires and rims; Interstate batteries; branded apparel; and more. Whether you are looking to restore a watercraft or building a dock at your new lake house, we either have what you need or can get it for you.